The full lenght album Hacia Donde is finally out ! 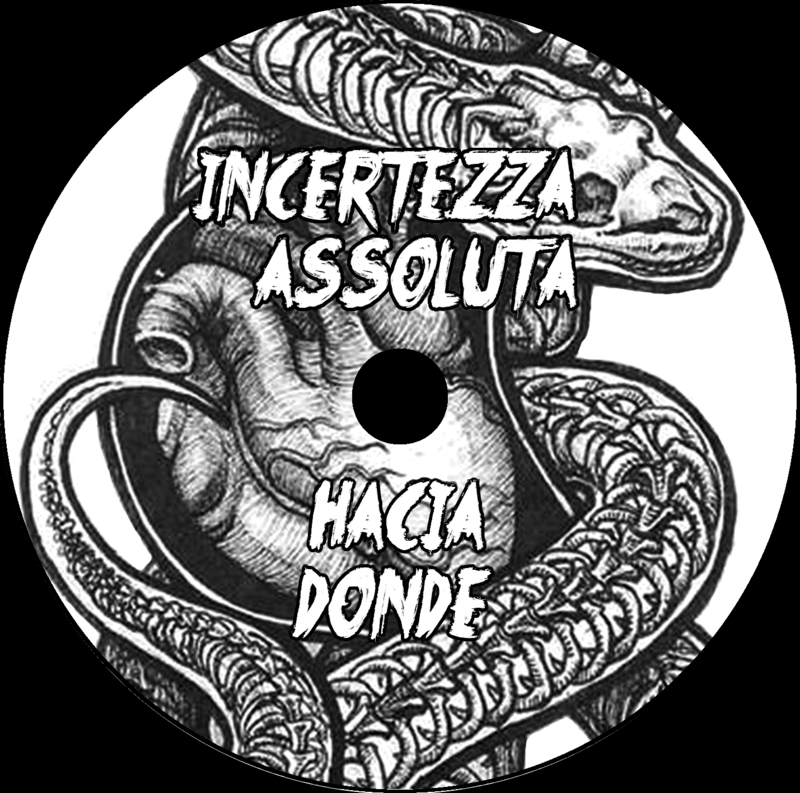 We proudly announce the final release of Hacia Donde! You can find all the graphics for DIY printing in this post (CD, front, back and inside jewel-case), as well as on the producer website. If you need .tiff or original graphics (made in GIMP), just write an e-mail to resiste @ squat . net. 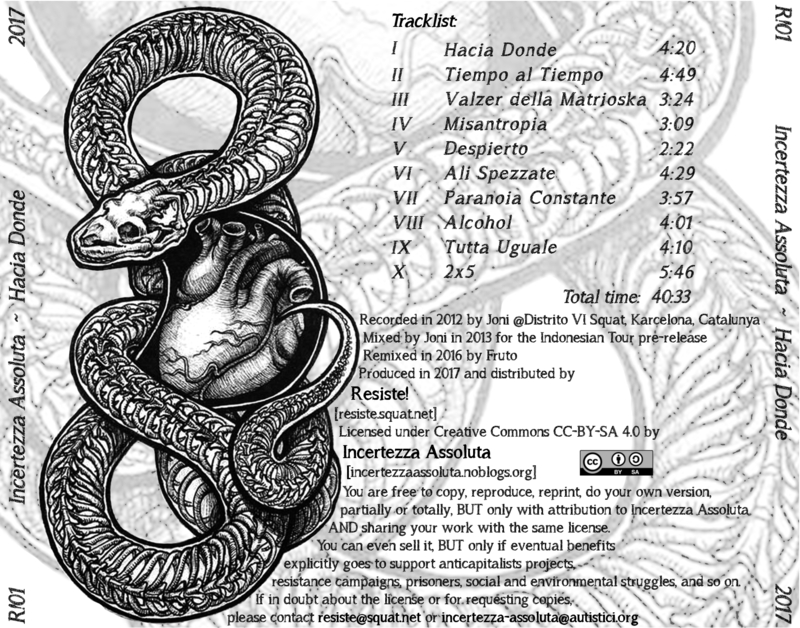 The jewel-case version which you can buy on this website have an inside poster with the print of the snake on the back and the pack contains also two stickers. T-shirts with the screen-print are available through the distri of Resiste! Thanks a lot to Resiste! 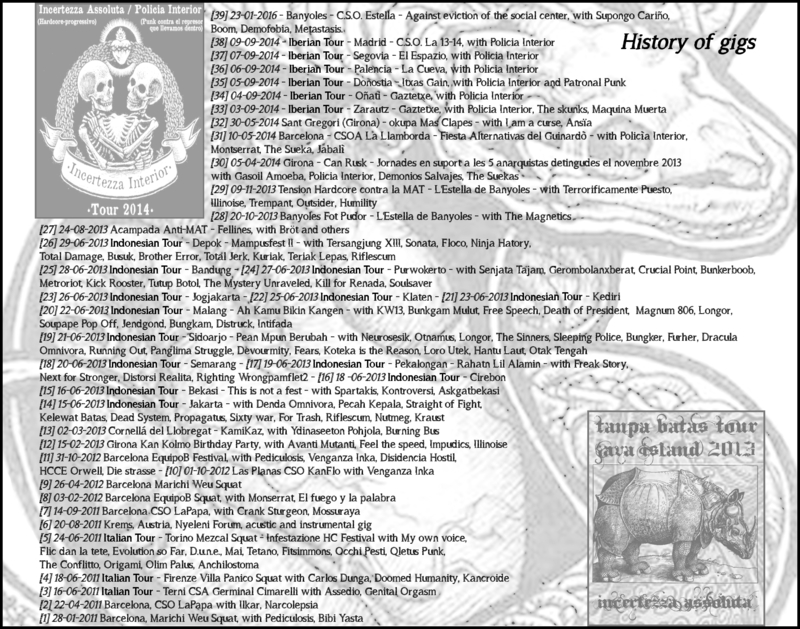 (https://resiste.squat.net/) for the graphics, production and distribution of Hacia Donde. All the contents are made under a Creative Commons License CC-BY-SA 4.0.
nella gioia del vuoto da scoprire. città in fiamme, la nostra RIVOLTA! ebrio de falsas verdades (x2). me dicen con el tiempo todo pasará. Tomo mi droga y me pierdo en el tiempo. del valor de una pistola dibujada en un cuarto. Pues mirame en los ojos y emborrachame. hablaremos y hablaremos otra vez mas. Despierto (x4) … de repente. toda la mierda que brilla! Nosotrxs hace mucho tenemos insomnio (x4). de un escaparate mundo omologador (x2). tin tin boxe superIO vs subcosciente. qua tratti di misantropia bestiale. 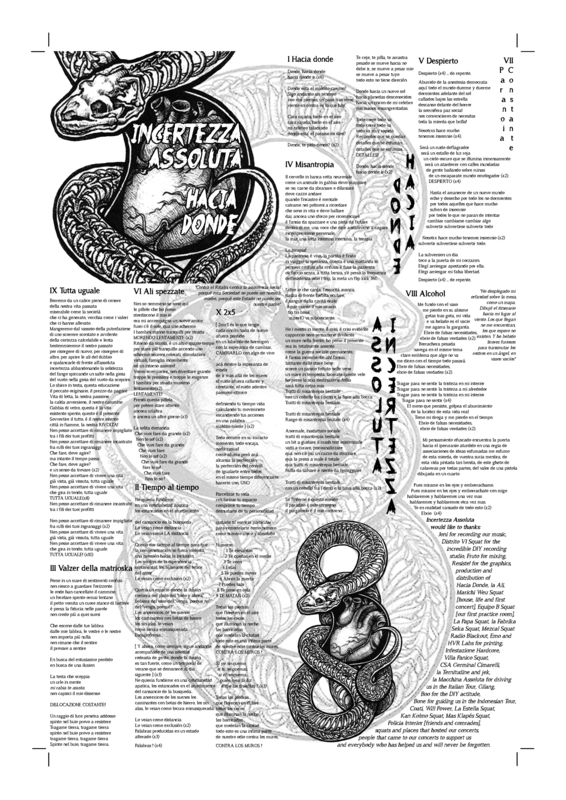 il purgatorio è il mio contorno. Spinto nel buio, tragame tierra. una pressión hacia la inclusión. del cansancio de la busqueda..
Howdy. Welcome to Incertezza Assoluta! You are free to copy, reproduce, reprint, do your own version, and even sell it but only with attribution, share alike, and only if benefits goes to support anticapitalists projects, resistance campaigns, prisoners, social and environmental struggles, and so on.